People complain that it's hard to get around in Japan because you're literally lost in translation. This isn't true for a number of reasons which I won't go into now, but especially when it comes to food. Most restaurants, even the high-end ones, have amazing plastic models in their windows called "sampuru" which show you pretty much exactly what you're going to get; when you get inside, the menus often contain pictures; and a lot of more casual places make you order in advance from a machine which has photos of all the dishes (it's a bit like buying a car park ticket, but what you get in return is a hell of a lot more fun). 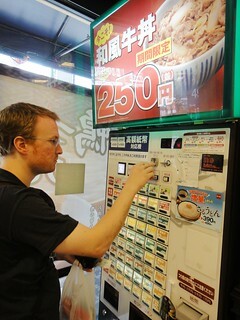 I loved using these machines because you could easily build up the craziest order possible without any confusion - press this button for extra noodles, that button for tempura on the side - but my favourite button was the one which got you a ramen egg. 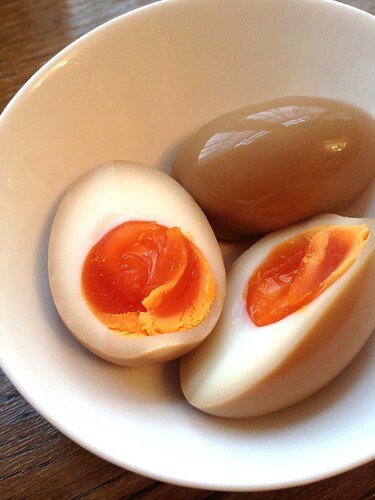 A ramen egg, if you're unaware, is the second most delicious soft-boiled egg in the world* in my opinion. 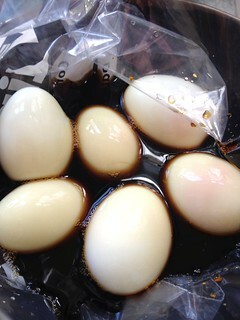 Also known as a hanjuku egg, ni-tamago or ajitsuke tamago, a ramen egg is soft-boiled so the white is cooked through, but the yolk remains molten (in fact some people refer to it as a lava egg or molten egg) and it's then marinated in a soy sauce mix. 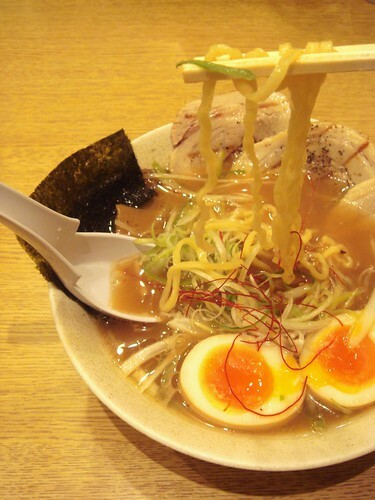 A bowl of ramen in Japan just isn't right without one of these eggs, though it goes very well with other noodle dishes such as soba and udon, and it even makes a fantastic sandwich - just smush one down in some bread and butter. Whisk the marinade ingredients together in a small bowl or jug and set to one side. Soft-boil your eggs - I use this method. As soon as they are cool enough to touch, peel them very carefully, making sure you don't split the whites. Place the peeled eggs in a large ziplock bag and pour the marinade on top. 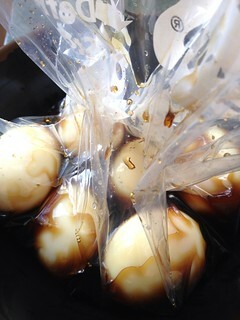 Roll the eggs around in the marinade, and then tie the bag tightly shut. Place the bag of eggs in a bowl and leave in the fridge overnight (turn them once though for even coverage). The next day, when you're ready to eat them - on noodles, on rice, in a sandwich, in a ramen burger - slice your ramen eggs in half and enjoy. My friend Cherry from Feed The Tang even serves an amazing canapé at her supperclub Fed by Tang where she tops ramen eggs with ikura ie salmon roe - actual genius. What a great post!! 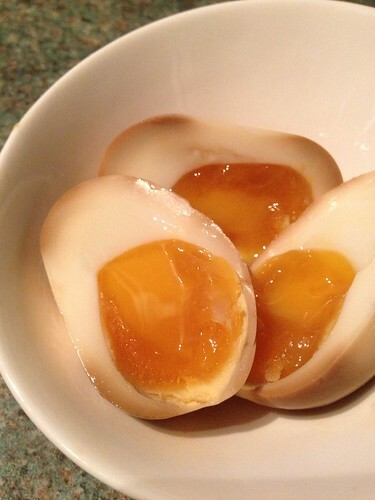 I LOVE raman eggs...will have to try these very soon! If I make this I will eat ALL THE EGGS! Hoping to try onsen eggs soon! 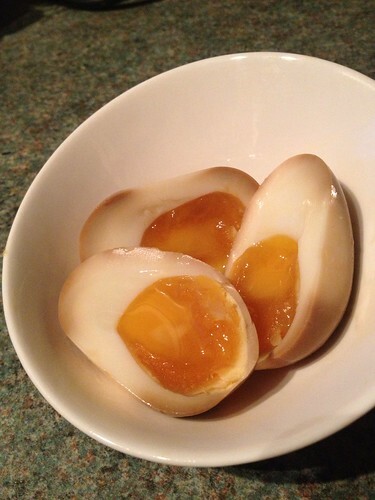 Out of interest, where does the tea egg come in your egg hierarchy? I am extremely concerned about the low position of salted. Would it be ok just soy and sugar? Any alternative to the mirin/sherry ? Oh, of course! It just adds a tang. Some people use fresh grated ginger and rice vinegar in the marinade for a similar kick. 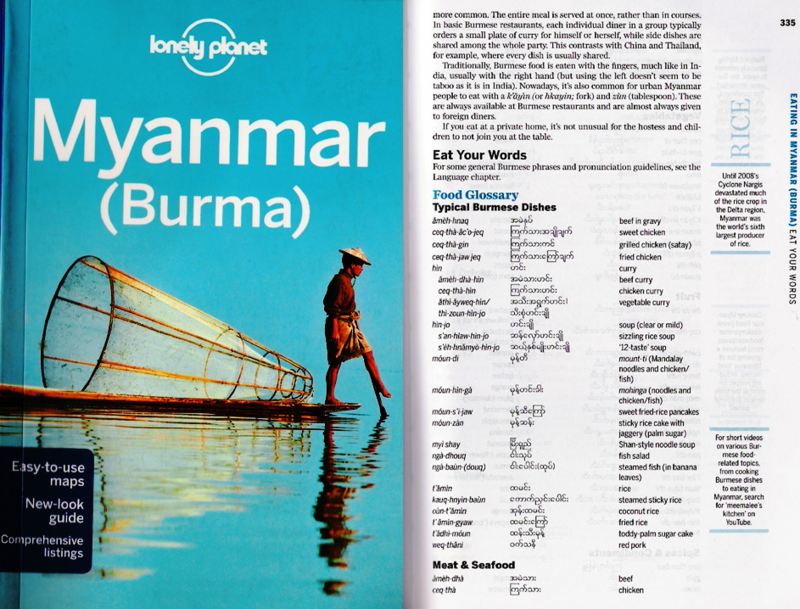 Hello, what lively article, thanks so much for the information! I was also wondering if you could use brown sugar ? You didn't explain how to cook them perfectly which is the most difficult part. Actually I did - I linked to a video where I demonstrated exactly how to cook them. Can we actually reuse.the marinade? Thanks! 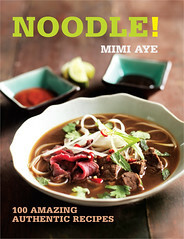 Thanks for the recipe but I'm curious, why does Asian food seem to always have sugar in it? Is there a way to make this without sugar? You don't need the sugar, but it won't taste as nice. I'm fairly certain not all Asian food has sugar in it, by the way, though it's used more in some cuisines eg Thai or Vietnamese.